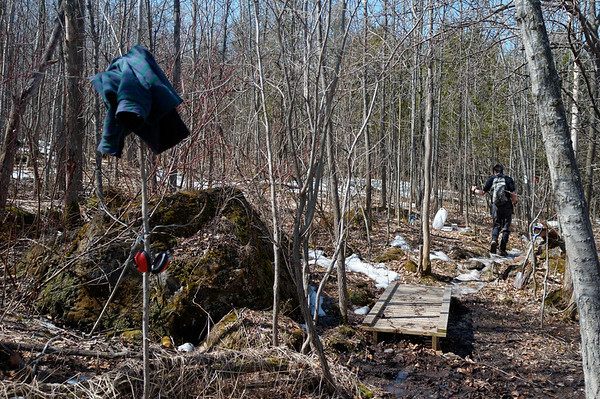 Given the ultra cold experience we encountered last time, we were all smiles as soon as we continued along the trail. There were some quirky characteristics about a number of the houses in Lavender — I won’t point them out here but see if you notice them if you ever pass through. Nothing bad, just neat! Following the past couple of hikes, we were ready for the cold this time around but the weather turned out to be surprisingly pleasant. Starting off where we left off last time near Lavender Cemetery — we set out along the road. I was a happy camper because the cold weather and freezing temperatures had me relying on insulated water bottles rather than a water bladder until today. Life is made so much more convenient when using a water bladder. Unfortunately the warmer temperatures also meant that I was more prone to allergies — I anticipated those pollen attacks. 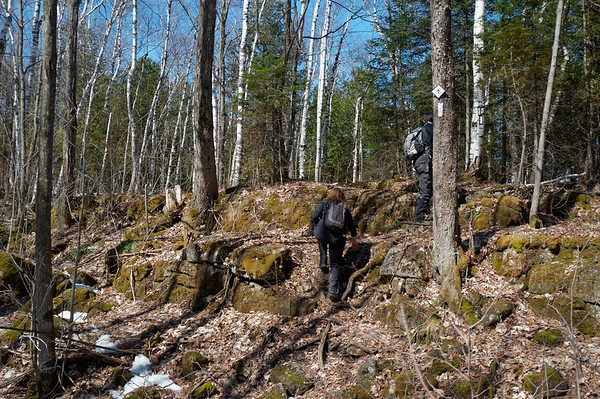 The trail continues along the road until we turn into the forest and find ourselves hiking over some really scenic crevices. With much of the snow receding, I’m enjoying the diversity in terrain once again. 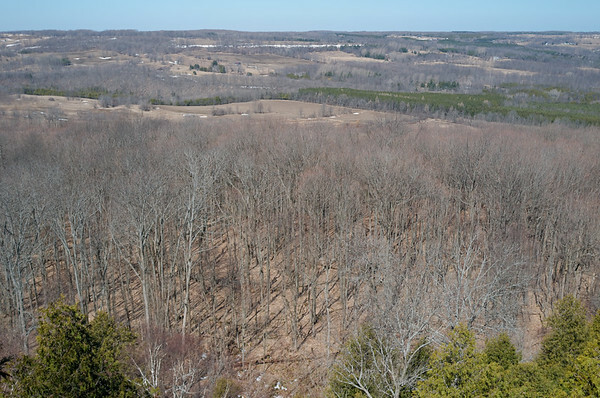 As we hiked further up along what I figured to be the escarpment, I noticed a very small clearing hidden in the trees and poked my head through. I’m so glad I stopped to take a look because we almost missed out on a very nice lookout point. Talk about hidden treasure. It was too early for lunch but I always wish lunch time would coincide with these lookout points — there’s nothing quite like enjoying your lunch while staring out into the distance and the horizon. We eventually came into a pretty wet area (read: mud!) but fortunately someone had been working on a number of boardwalks — or so we think. There seemed to be someone’s belongings scattered along the boardwalk’s vicinity. We even noticed that they brought a leveler to help with building the boardwalk. 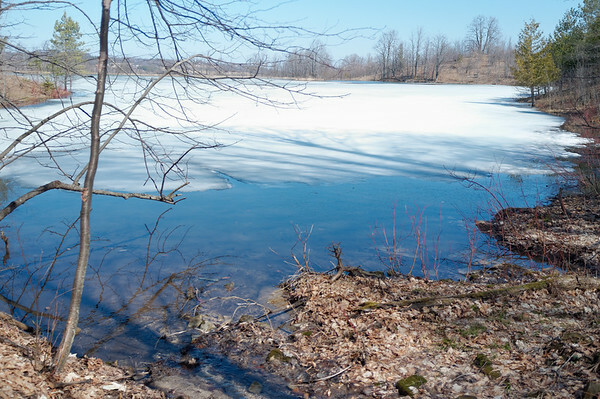 The weather may have been warm enough that we were in t-shirts (we were shedding layers as soon as we began the hike), but we passed a number of bodies of water that were still covered with ice. I would have liked to skate over this during the winter but I never really thought of bringing a pair skates on a hike before. We soon found ourselves back on a long stretch of road. There was something serene about trekking along the side of this road. Despite the vehicles driving past us, hiking along the road can be entertaining at times. Some cyclists were flying past us at such a high speed that we could even hear a high-pitched whirl from their wheels. 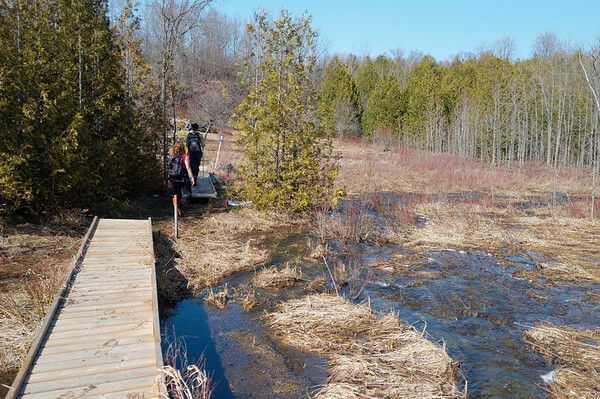 I often tell people that there is always something interesting to see or encounter along the Bruce Trail. This time we passed by an old schoolhouse with a bell and all. We weren’t able to discern what year this was built but someone must have been doing some upkeep. The windows did not appear old and seemed to be in decent condition. 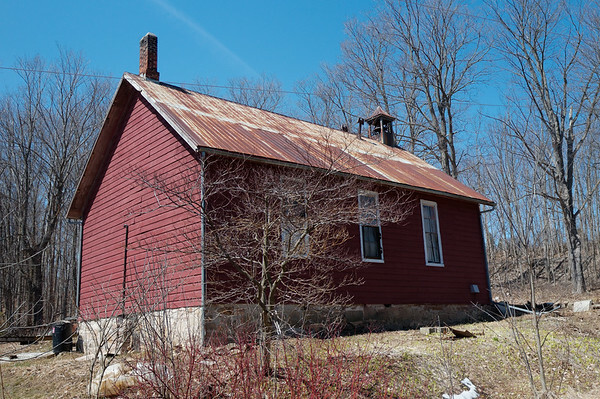 I remember reading about schoolhouses like these when I was young and seeing them in dramatized reenactments at places like Pioneer Village or on television. I wonder how long schoolhouses such as these continued serving the role of providing a roof for the purpose of educating Canadians. 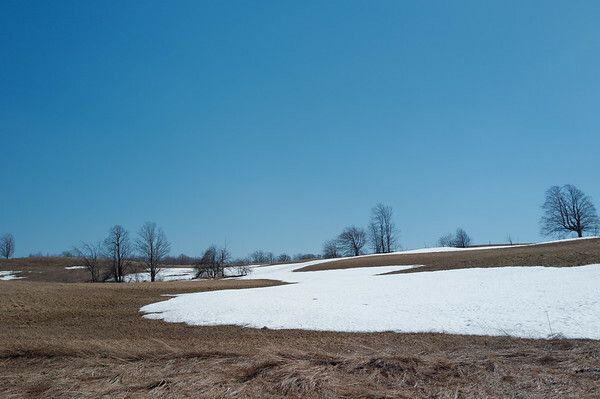 Just as we thought life was getting easier with all the receding snow — we got routed right through a large field full of it. Crunchy snow is one thing but melting and mushy snow makes for a tough trek across the field. It was a beautiful sight to take in despite the challenge that it posed. If big blue skies and clouds are two things in nature I love dearly, then vast open fields and rolling hills must be next on my list. I’m sure I’ve stated it before but I can’t really get enough of it. 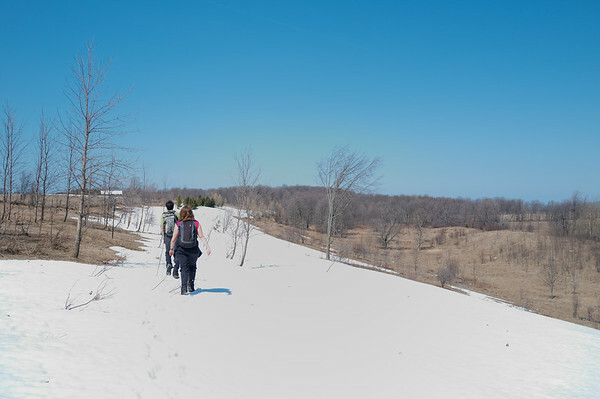 Don’t let these soft rolling hills fool you though, they are still a challenge to hike — particularly when muddy or covered with snow. I think I could sit down and spend an afternoon just staring out at a scene like this. 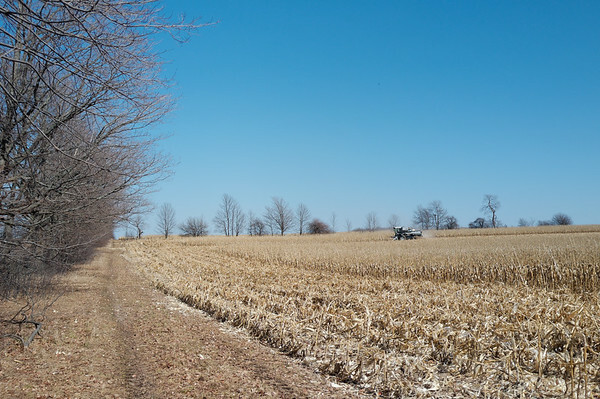 After trudging through more mud (yes, we got past the snow for now) — we passed through a large farm with a vast field of unharvested corn from the past season. I guess they were preparing the land for the upcoming planting season because we saw the harvester busy at work. I was hoping it would come closer to us so I could get a better photograph of it but I also didn’t want it to stir up all the dust and spray corn at us. Stepping onto the last stretch of road for this hike, there were a couple of bodies of water we spotted along the road. With the cloud-less blue sky, the water sparkled and appeared perfect for a swim. Of course, it was probably too cold and the water was likely meant for other purposes. Speaking of cold, as soon as we reached the end of the stretch of road, we found ourselves trekking on snow. This time it was very wet and slushy and to make things worse, there was a pretty high chance of plunging your foot into deep cold and slushy water too. When we reached the end of the road, we also passed by a group of people who seemed to be intent on camping. They were only wearing running shoes. We could hear shrieks and laughter as we made our way down the trail so I imagine they probably took a nice foot bath as they made their way down the trail. Hope they had a few spare socks! 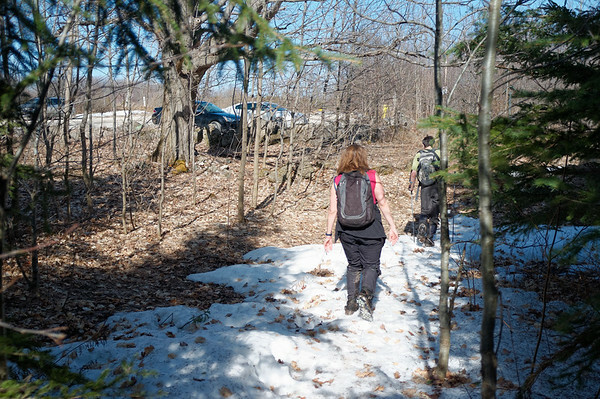 It was pretty amazing to see all the snow remain in certain sections of the trail and one could actually feel why if you stepped into the trail at that point. 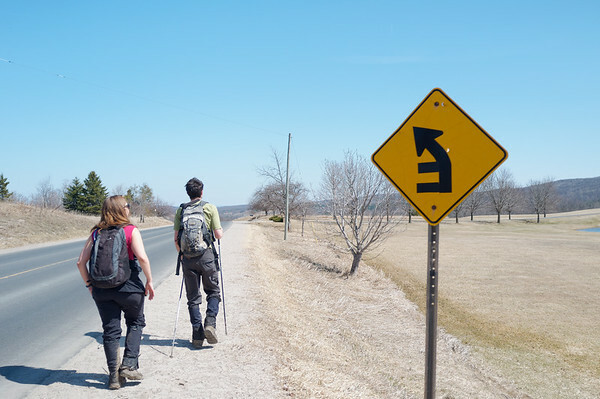 Some parts of the trail felt really warm while other areas — despite being sunny — received a lot of cold drafts or breezes of air. I figure this might be why certain sections are so slow to melt away. The last bit was pretty tiring — particularly since our feet at that point were pretty soaking wet, or at least feeling damp. 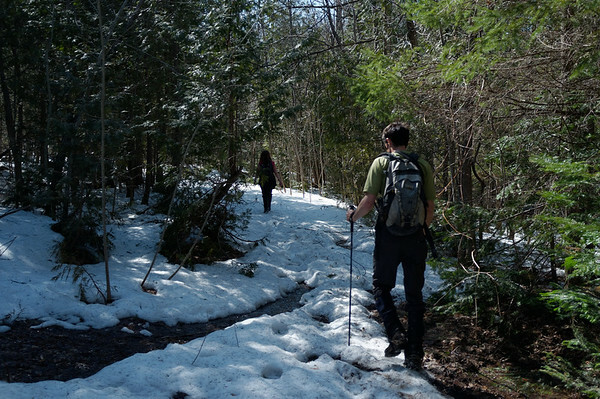 The inconsistency of the snow made it additionally challenging for us to maintain balance on the trail. Once we spotted the car, we quickly made our way towards it and started drying our feet! I didn’t have spare socks so I ended up driving barefoot home. After a hike like this, we were contemplating places to enjoy dinner. 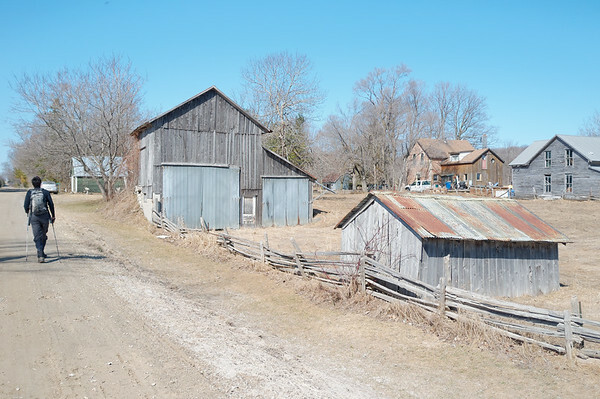 Fortunately, the town of Creemore was close by and its main claim to fame is its Creemore Springs brewery (one of my favourite brews). Alas, the brewery was closed already when we arrived in town but they did have an excellent pub across the street and it was the happening place in town. Busy place with great food, I recommend their chicken pot pie which was excellent. I only wish they had better desserts to offer, which I skipped this time around! 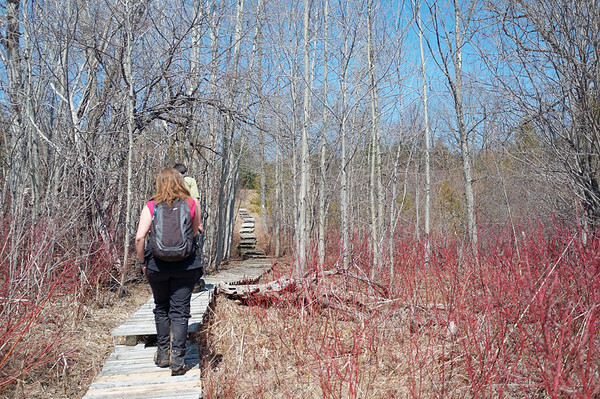 The next hike will be interesting — I only hope that it isn’t full on mosquito season yet! Take a look at the full gallery from this hike. explorewithehren Create a free website or blog at WordPress.com.